Magnetic chucks use the magnetic force from a permanent magnet, electromagnet, or electro-permanent magnetic material to achieve chucking or holding action. In recent years, magnets have increased in popularity as an alternative to mechanically-holding workpieces for machining and holding. In general machine shops, are magnets reduce setup time and increase access to all sides of the workpiece. They are a valuable tool for workholding in surface grinding applications. There are many advantages to using magnetic chucks. Consistent clamping pressure ensures that there is no variation in how tightly or loosely the workpiece is held; full support of the workpiece surface decreases cycle time by securing its center area. Magnetic chucks have shorter setup and take down times because the workpiece can be placed right on the magnetic plate, and vices can be secured using the magnet. Magnetic chucks make centering and working with small workpieces more difficult because they lack sufficient surface area. Vises can hold smaller parts as well as non-ferrous materials, however, and simply placing several vises on a magnetic chuck and pushing a button to secure all the vises at once is a time-saver. 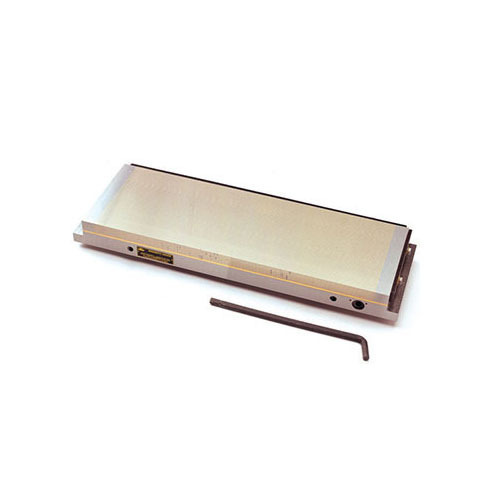 Permanent magnetic chucks are manufactured from magnetized materials and exhibit a constant magnetic field without needing to introduce an electric current. Because these materials are highly magnetized materials, they do not lose their magnetic force. This also eliminates the need for electrical connections, switches, brushes, wires and auxiliary generators. The magnet is made of a special alloy and has high power and indefinite life. Most industrial permanent magnets sit within a carrier. Alignment of the poles determines the state of the magnet (whether it is on or off). In operation, these poles are physically moved to activate and de-activate the permanent magnet. These machines are best used for light duty machining because of their reliability and safety, but as the demands of the machining operations increase and the machines are scaled up, the mechanical effort required to overcome magnetic friction to turn the poles on or off becomes too great. Advantages of permanent magnet chucks are their independence from electrical power and ease of installation for transfer from one machine to another. They do not generate heat, which could deform the pole plate or workpieces, and have a very robust design. Since they don’t depend upon electrical current, there is no danger of the pieces being thrown off or released by power failure. 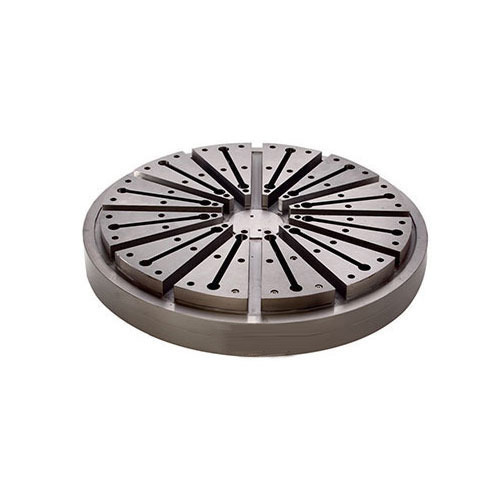 Disadvantages of permanent magnetic chucks are that the chuck dimensions are less adaptable for big workpieces, and are not as suitable for heavier workpieces. The mechanical switching system is not efficient for automated work, and it cannot be used with components at a temperature above 80°C. 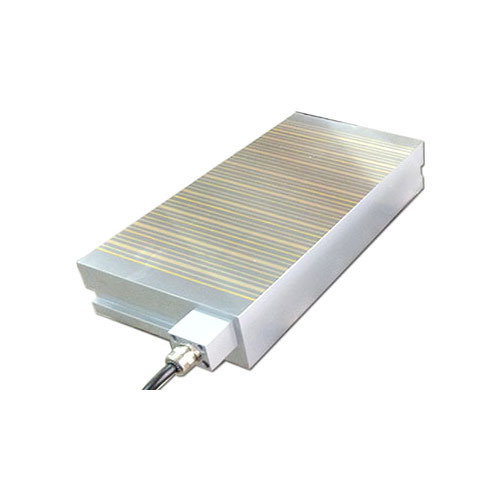 Electromagnetic chucks generate a magnetic field when electrical current is introduced. The field is created with coils supplied by direct current (DC). These chucks are activated with a control unit which allows quick magnetizing and an easy demagnetizing of the workpiece. 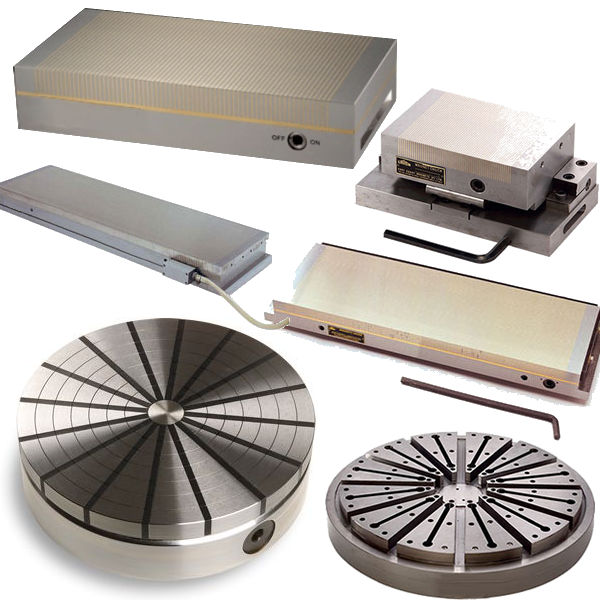 Electromagnetic chuck systems can be manual, automatic or combined. Advantages of electromagnetic chucks are that the chucks can be operated with control units which can regulate the magnetic force and control the demagnetizing cycle, allowing for easy removal of the workpiece. Due to the coils, a strong magnetic force is generated to tightly clamp the workpiece. These devices can also reliably clamp rough workpieces and various chuck dimensions can be produced, enabling the user to meet the requirements of the workpiece size. The disadvantage of this type of chuck is that it requires a power supply, and for safety reasons, often needs a back-up power supply as well. The system also produces heat, which can affect the accuracy of the machining. Electro magnets are not practical for machining operations because they require a continuous source of electric power to maintain magnetic attraction. Should power be interrupted, the electro-magnet loses its ability to hold the workpiece and creates a safety concern. Electro-permanent magnetic chucks are a hybrid of electromagnetic and permanent magnetic chucks, which allows these units to be larger and more powerful for metalworking applications. The fast action of strong direct current enables the system to take advantage of the ferromagnetic material to become a permanent magnet. In this state, they do not need an external power supply. An electrical current is applied to lock and unlock the chuck, but in the event of a loss of power, the chuck continues to hold the part tightly. An electro-permanent chuck contains a number of steel poles, each alternating between north and south polarity. The number of poles depends on the size of the chuck. Two magnets are sandwiched between the poles. One pole is an electronically switchable permanent set and the other is a permanent set. The permanent sets are constantly polarized in one direction and the switchable magnets have an electric coil around them so they can be polarized in the north or south direction by passing a current through the coil. When both sets of magnets have the same polarity, full magnetic power is achieved. When both sets have opposite polarity, they cancel each other out and the magnet surface is off. Advantages of electo-permanent magnetic chucks are that operation from a control unit provides the possibility for automated use. There is minimal electricity consumed, and there’s a greater safety factor since a loss of power won’t cause the chuck to release the workpiece. The device can also handle heavy milling operations. Since its temperature doesn’t fluctuate, there is no threat to machine accuracy. Disadvantages include the higher cost of electro-permanent magnets than permanent magnets, and a higher sensitivity to air gaps between the chuck and component.